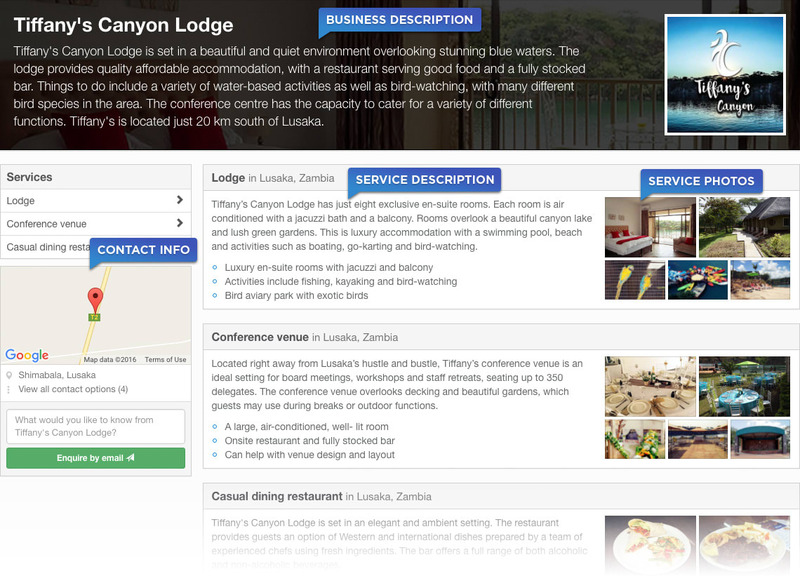 A complete marketing system specifically tailored for businesses in Zambia. Increase your sales and grow your business using our system to reach new people and retain current customers. Your mini website is not so mini! It’s like the online version of the best company profile you’ve ever seen. Your mini website is essential for your business because it has everything customers need to make a buying decision, such as your contact info, photos, prices, products, services and an online shop. If you don’t already have a website, a mini website on thebestofzambia.com solves all the fundamental online marketing needs of your business. If you do have a website, a mini website is another way to market your business and capture an additional audience. The marketplace is like the biggest Zambian shopping mall ever, but online. Being in the marketplace is crucial for the future of your business. Your online shop allows people to view your stock from their phone or laptop, compare products and make purchasing decisions without having to actually visit you. It exposes you to a new pool of customers; who don’t know about you; or are not motivated enough to physically visit your premises. If you’re not yet ready to sell online, use the Marketplace to showcase your products allowing people to browse and understand your range. And if your business is ready to sell online we’ll manage the whole complicated process for you. 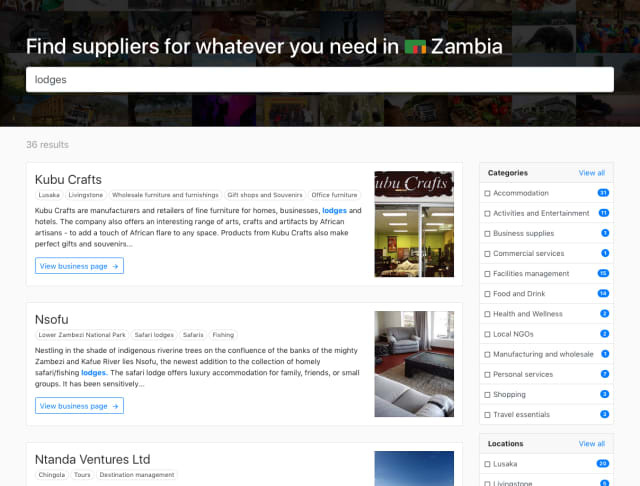 Our directory is like a catalogue of Zambian businesses, but better, and online. Your business is listed on the pages in the catalogue that reflect what you do. For example, a school will be advertised in the primary or secondary school page, or both. Advertising in the directory and appearing in relevant search results is critical for your business because it helps people looking for what your offer quickly find your business page and buy from you. An annual printed version of the online directory. We believe online marketing is an affordable, scalable and far-reaching solution, but there is definitely still a place for print. It is important for your business because it is used for reference and procurement and is distributed to hotels, airports, exhibitions, schools, cafes and all thebestofzambia.com clients. It is the most accurate and up-to-date printed information about businesses in Zambia. This is like having your own marketing assistant. You’re probably overloaded, overwhelmed and frustrated with marketing your business online and it’s challenging to find the skillset, time and financial resource to market your business effectively. We ease the marketing burden by producing professional marketing messages for you! We advertise your time sensitive marketing messages like your events, news, and offers and we work with you to produce creative content like PR articles. 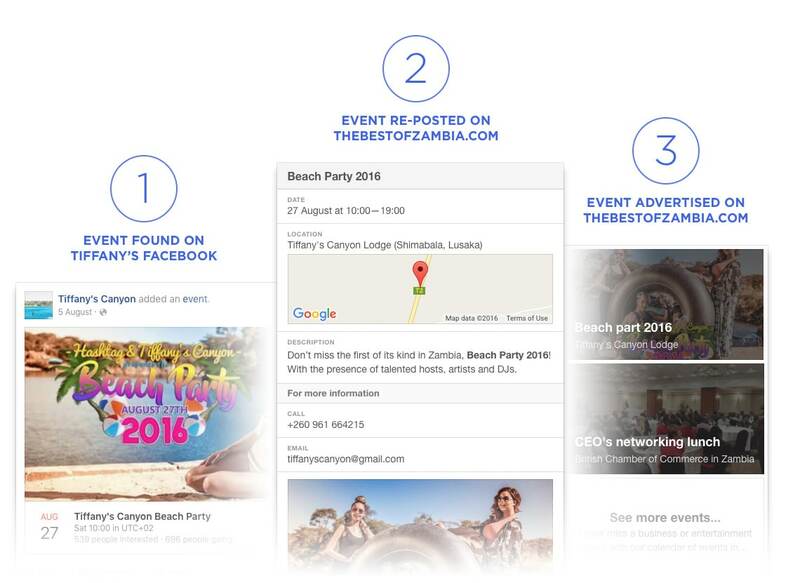 Our content ranks highly on Google and is distributed to Facebook, Twitter, Instagram and email subscribers. Everyday, thousands of consumers use thebestofzambia.com to make buying decisions. Position your business in front of this growing audience right when they are looking for the services and products you offer. The Best of Zambia is a fantastic website allowing us to have exposure within and outside of Zambia. It performs very well on Google search and the team are very proactive with their blogs, e-newsletters, events, offers and news channels. We are very pleased to work with them. Royal Zambezi Lodge has been using The Best of Zambia for over 4 years now and we are very happy with the service and the exposure it gives us. In particular we have seen a marked increase in online and phone enquires since the introduction of the special offers section. All we do is let The Best of Zambia team know about our offers, they get them published and we see the results. We would recommend The Best of Zambia to any business in Zambia. 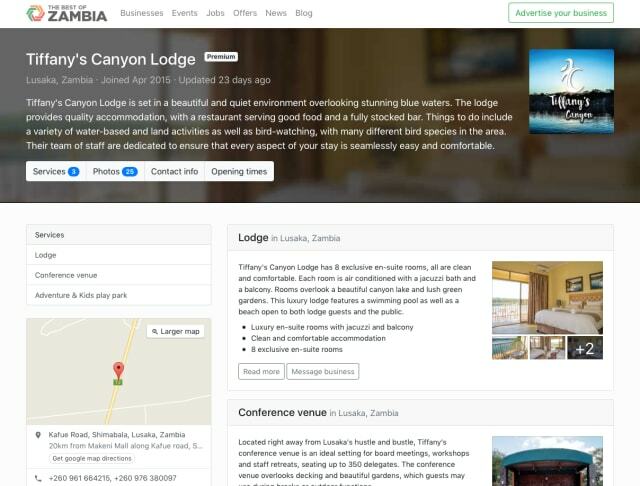 We quickly noticed that we started to get enquiries through The Best of Zambia (several from overseas). Many of these have turned into substantial business for us and have impacted our business significantly. We are now expanding and moving into larger offices to handle the increase in activity. Tiffany's wanted to do more online marketing but it was time consuming and required specialised skills. That's why they used our marketing system to help them market their business with minimal human resource and financial investment. They freed up more time to spend on their business knowing our platform was working for them. We carefully crafted Tiffany's an online company profile page so customers could find key information, photos and contact details. 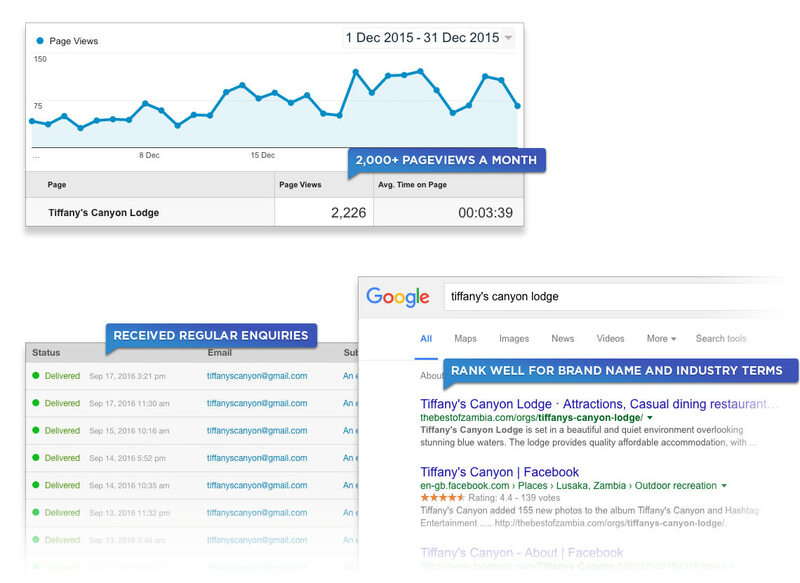 We advertised Tiffany's business in the places people are looking for the services Tiffany's offer. 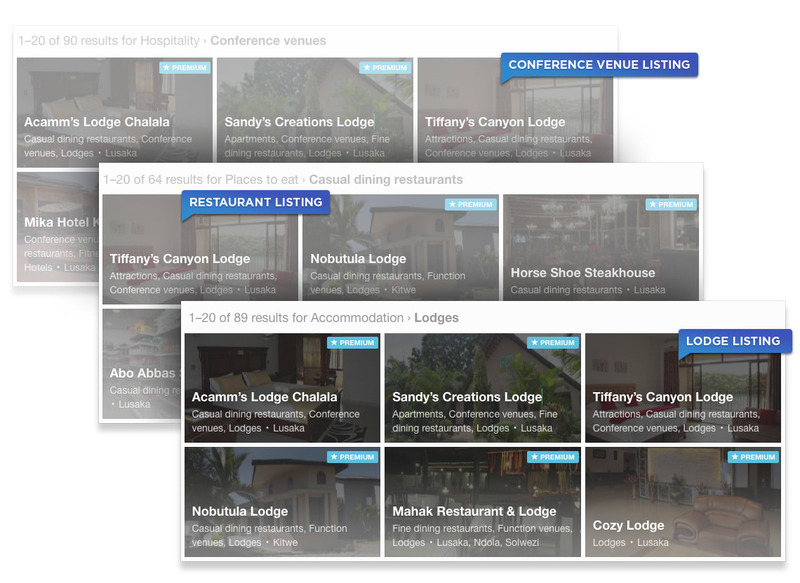 They were listed in our 'Lodge', 'Conference Venue' and 'Restaurant' pages. 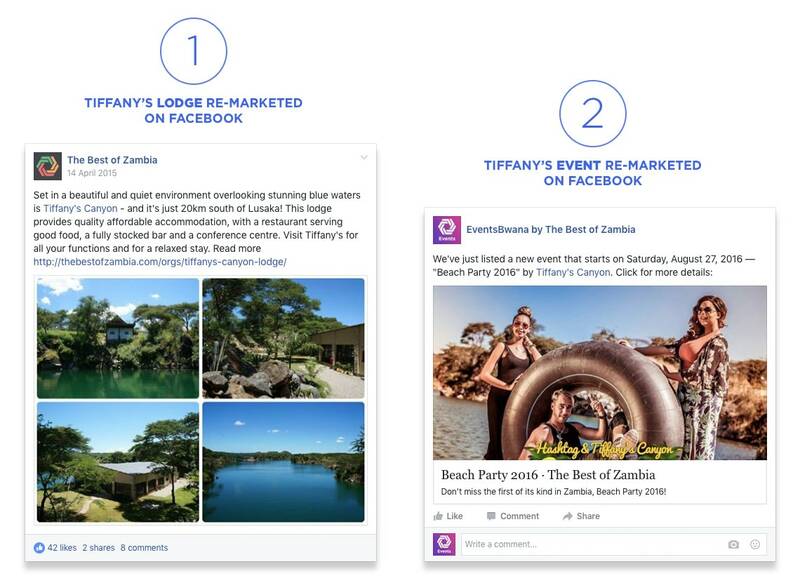 We found any promotions (events, offers and news) Tiffany’s posted on their Facebook page and re-advertised them on thebestofzambia.com. Tiffany's could also approach us at any time to advertise unlimited promotions. 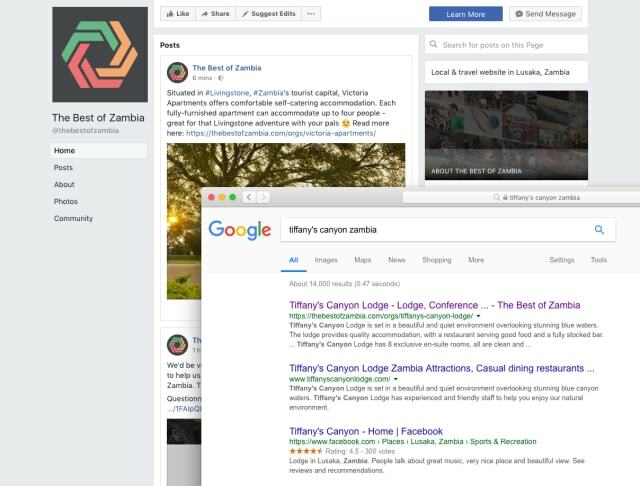 We re-marketed any services, events, offers or news we posted on thebestofzambia.com to Facebook, email subscribers, blog readers and search engines. Increase your sales and grow your business using our system to reach new people and retain current customers. Most businesses in Zambia will see a return on investment after just 1-3 sales. And we're extremely confident we can help you get more than that. Get started today to increase your sales and grow your business. Join 500 businesses successfully advertising their business, products, services, events, offers and news using our powerful and effective system. We typically reply via chat within a few minutes. If not, you can expect a reply via email within the hour. If you prefer to call, our phone number is +260 (0) 978 394856.